If youi’re a Hog 3 user and a WYSIWYG user, you might already know this, but I just started using Hog 3 (being a lifetime Wholehog 2 guy, figuring it was time), and I do lots of pre-viz stuff offline. 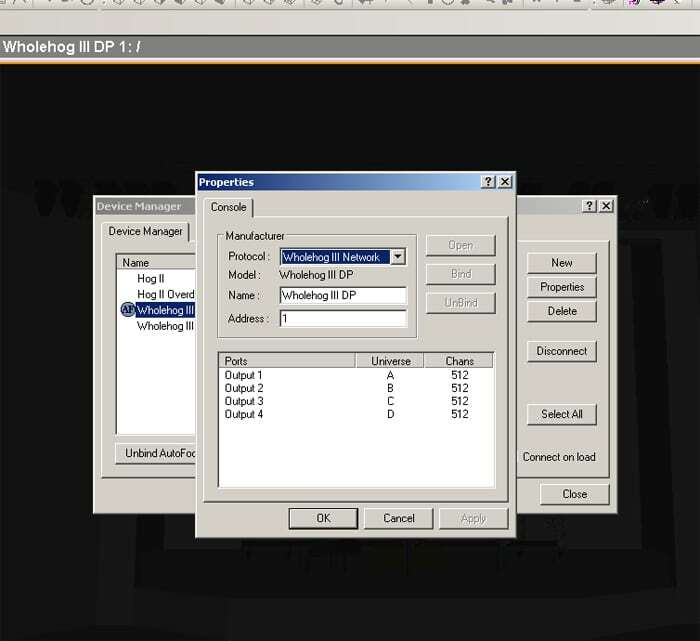 As you’re setting up WYSIWYG Perform to connect to the virtual console, in this case, Hog 3 PC, you might notice that you’re only able to bind 4 DMX universes at a time to the Hog 3 PC through WYG. This, at first, might seem like a real problem – especially if you’re using more than the alloted 4 bindable universes in Hog 3 PC. For example, I’m designing a rig right now with 5 universe of DMX – my fifth universe has a bunch of VL3500 Spots on it. So what do you do when you need to have to use more than the alloted 4 universes? Simple – add another Hog 3 PC and connect! So, you might recognize the image above as the patch screen on a Hog 3. At the bottom I have my 8 VL3500’s patched into what appears to be a second DP-8000. Yeah, that’s right. A second DP-8000. 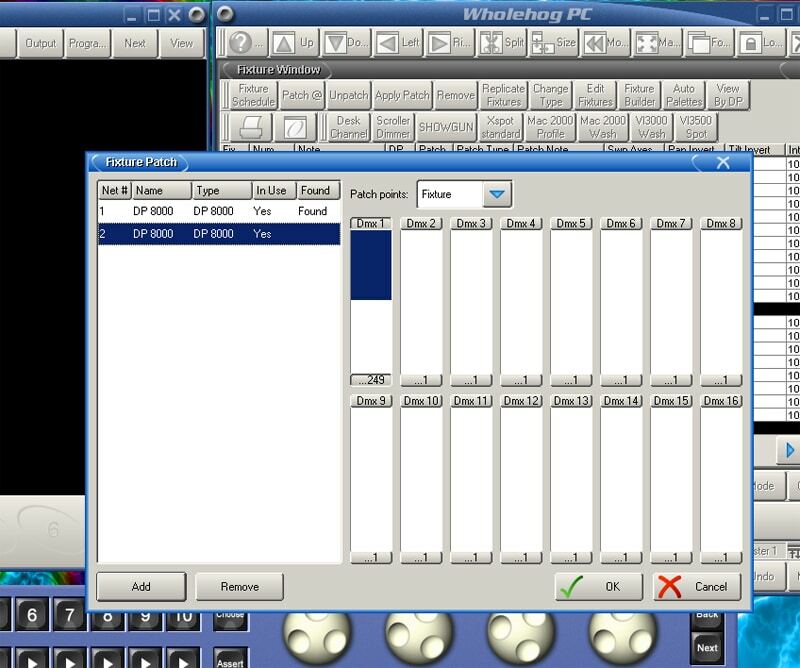 How this needs to work is that since WYSIWYG needs to bind four universes of 512 at a time, you have to add a second DP-8000 digitally to the mix. SO: universes 1-4 on the first DP stay labeled as 1-4, but universe 5 will appear as universe 1 on the second DP-8000. Simple. The next step is to add another DP-8000 in Hog 3 PC. After clicking the “Patch @” key in the patch you’ll arrive at the Fixture Patch screen. Once you’re there, click “Add” to add a second DP-8000. Make sure that you number it 2, and that the first DP is number 1. Click OK. The way I have mine set up is that the first DP is using the first 4 universes, and the second DP is mapping the fifth universe to the first output on the second DP. Confusing yet? It’s not really. 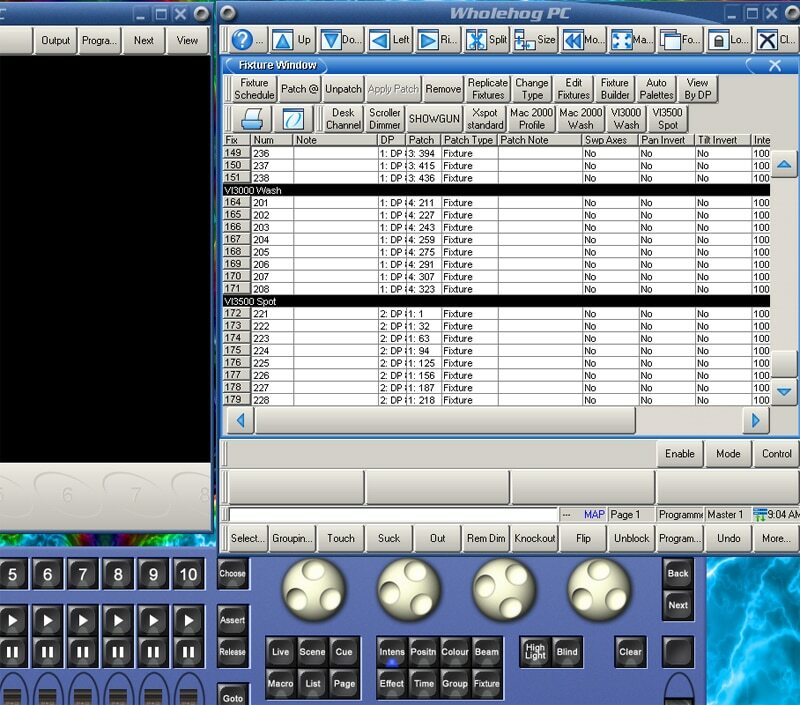 I have my addresses labeled A-E in WYSIWYG, so 1-4 on DP1 are A-D, and E is on DP2’s first output. Like below – this image below is DP2’s first output. What you have to remember is that when you’re patching whichever fixtures you wanted in those universes above 4, you’ll need to make sure to select the second DP, like I have done here. Only after you patch, obviously, will the data show up on the second DP. The next step is to tell WYSIWYG that there are two DP’s. 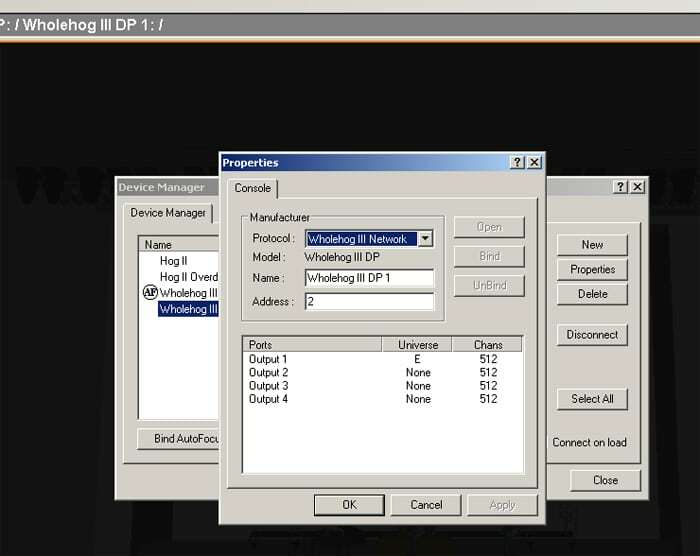 Once you add your two “Wholehog III DP” devices in WYSIWYG, you need to bind to universes and number them. Mine, just like in the patch, are labeled 1 and 2, with 1 being bound to universes A-D, and 2 being bound to universe E.
Here’s the second DP, numbered, bound, and ready to go. 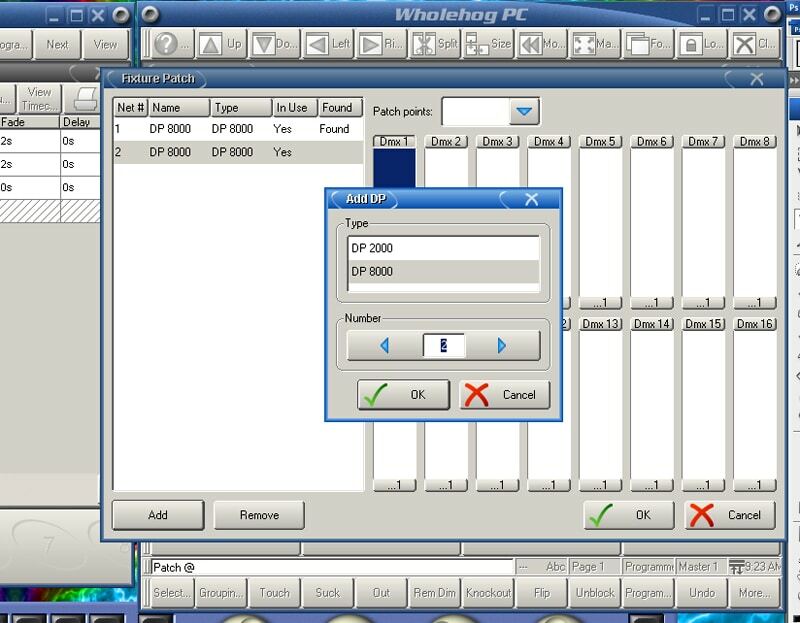 As in the image above, once you have both of your DPs numbered and bound to universes in WYSIWYG, click each one and click “Connect.” If you’ve done everything correctly, you should be right as rain and ready to go. 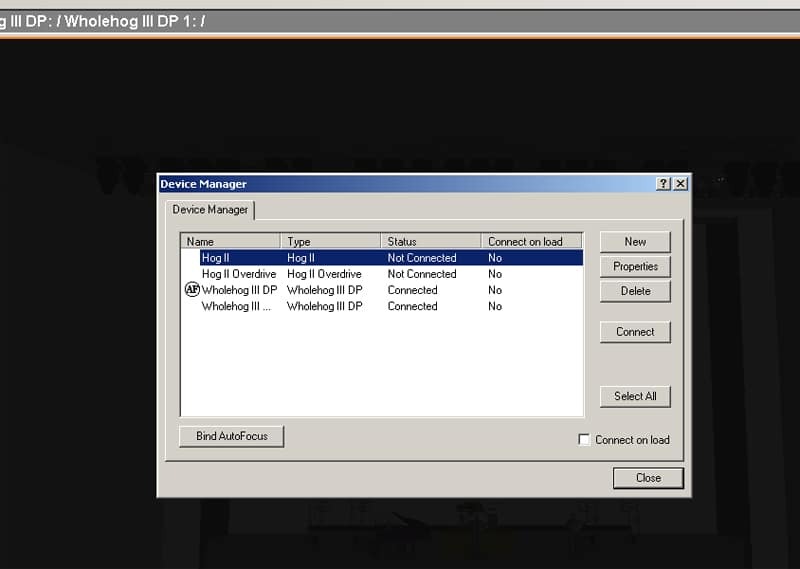 If stuff is still funky, check your settings on DPs in both WYSIWYG and Hog 3 PC, which is usually where the problem lies. This is repeatable for more than ive universes as well. If you were using 8 for example, A-D and E-H, A-d would still be on DP1 and E-H would be bound in DP2. Easy as cake – no, it’s easy as pie. Previous articleThe New Years’ Eve Ball is An LED Supernova! Ben and I did a show on Hog 3 in January. It was fun. I hope they’ve worked some of the kinks out by now.